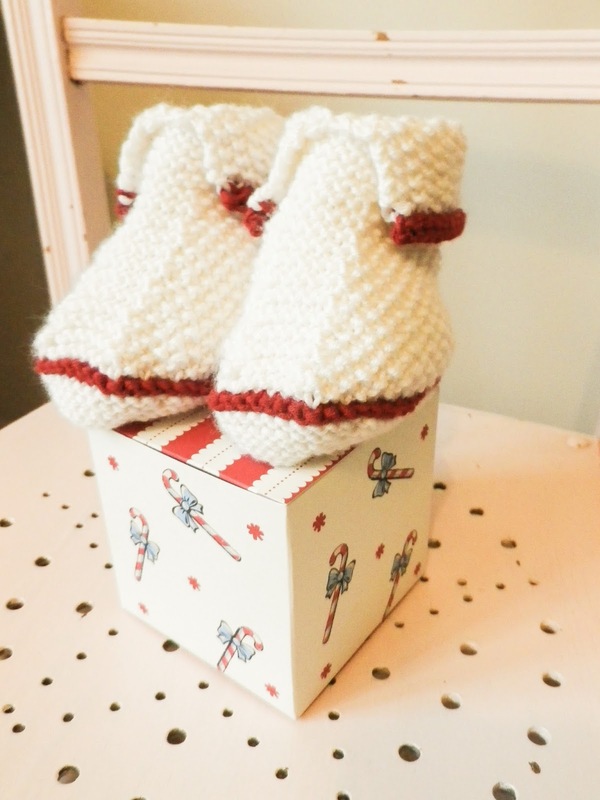 These are the cuff bootees from Debbie Bliss' simply baby. First of all in the larger size (3-6 months) made for little Baby Leo. No idea why I made the larger size, sorry Leo, I do hope they fit you sometime this winter. Or next. 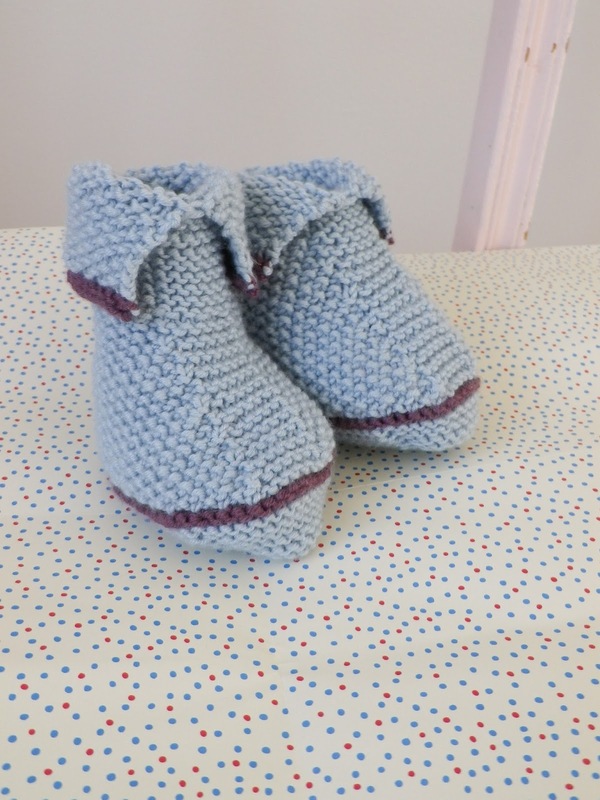 And then another pair, this time in the smaller 0-3 months for Patch's lovely teacher at Christmastime, who was just starting her maternity leave. Hopefully these are keeping Matilda's feet toasty. I used some Debbie Bliss Baby Cashmerino from the basket for both, so not sure of colours as the ball bands have wandered. I do so like using wool from the basket... though I do also like buying new wool, too. 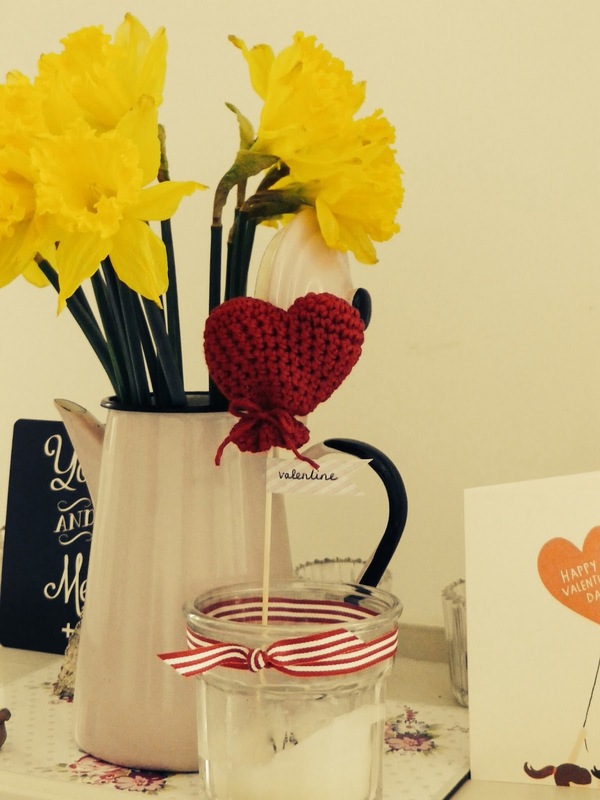 Have you heard about the weekend blanket-along being organised by the lovely Cherry Heart? Rather excited to revisit a crochet hexie blanket which has been abandoned for a while. I love working on this blanket, but there always seems to be other things more pressing. Well, no longer at the weekends! I have signed up, I have mentioned it here so surely that means progress will be made! 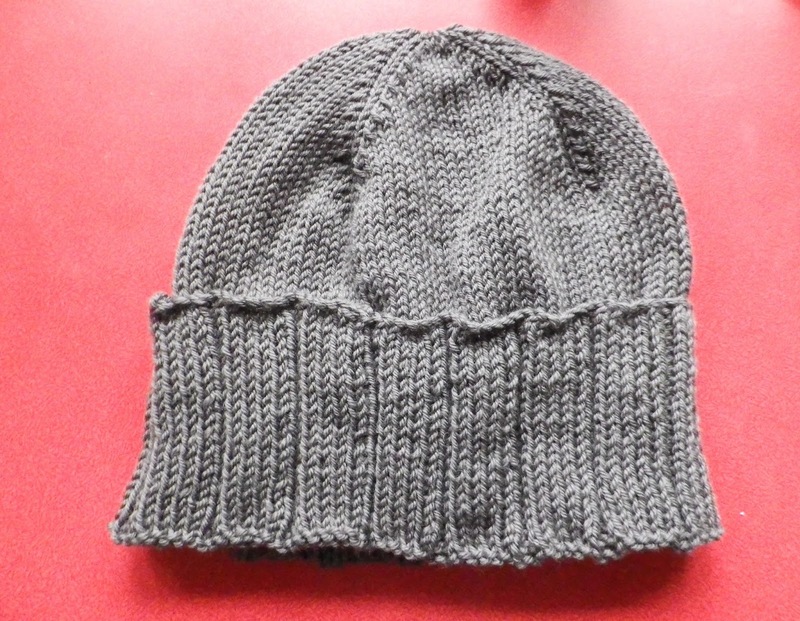 This is one of the thank you hats - the simple rib hat. According to Purl Bee, this hat is sized to fit most women and some men. Now I know Mum has commented on the size of my Dad's head before, and believing it to be on the smaller size I decided this would be the perfect fit for Dad. It is a simple, quick knit and it does fit Dad... rather snugly. Turns out my Dad has a larger than some sized head. 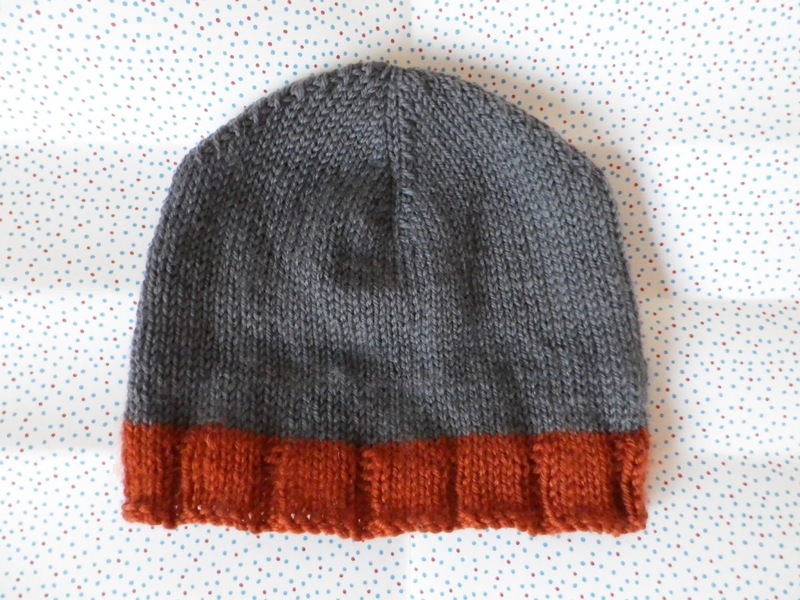 I used yet more Rico essentials soft merino aran, in the lovely named mouse grey with a cinnamon trim. 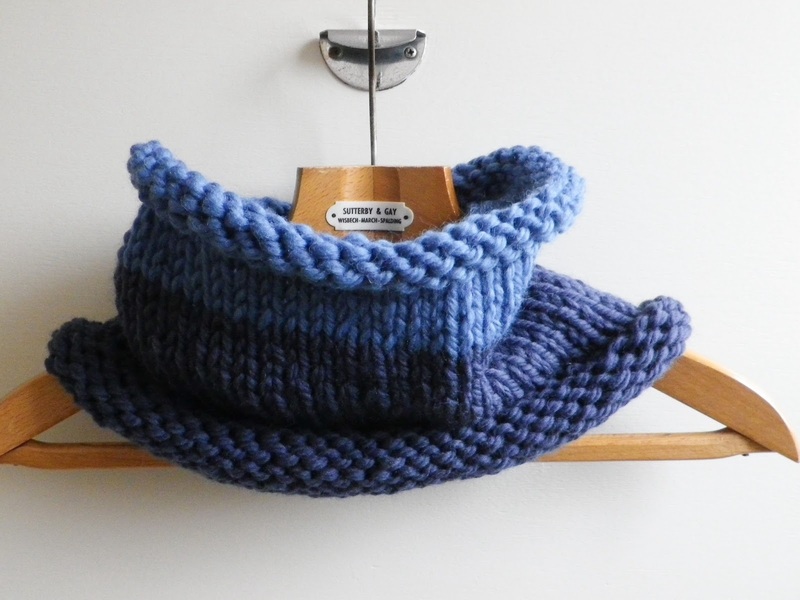 It has been an age since I made one of these cowls. 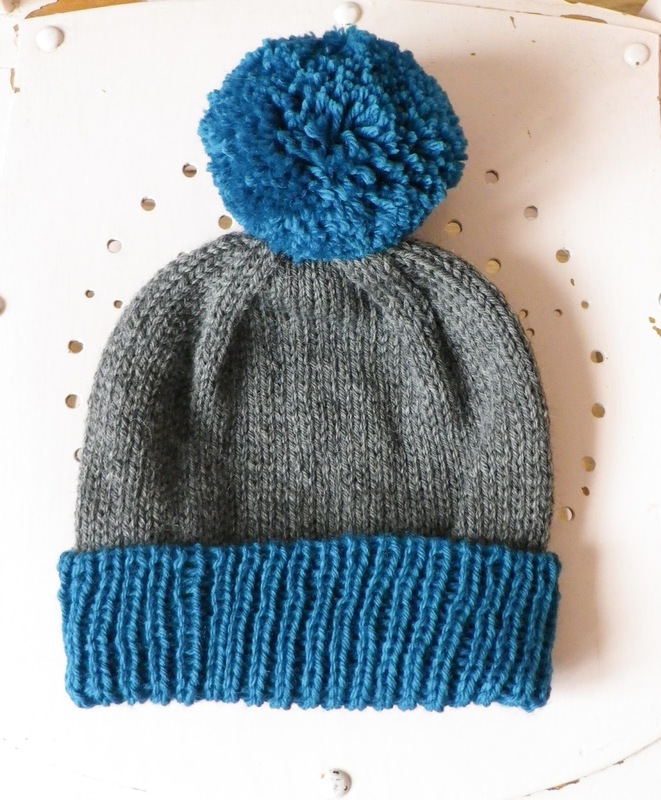 I oh so much want to make myself another to save the grey one I made a few years ago from being worn every single day in winter, and have you seen the yum colours of Rowan big wool? I shall add it to the list, but really I should just do it because these cowls take only an eve in front of the television. I had a small ball of the lighter blue - steel blue - already in the basket so decided to find a nice colour to go with and make my first colourblock version. I love it! And hope you do too, Bea...The darker blue is blue velvet. Oh yes, and the pattern - the chunky cowl from Jenny Lord's Purls of Wisdom. 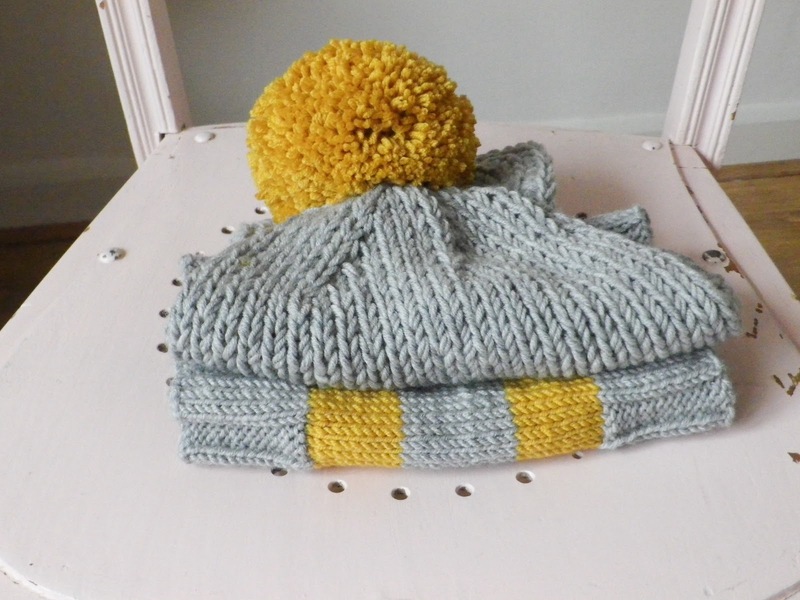 Purl Bee's super soft merino hats for everyone. Well, for Linda. And this one really is super. Super sized. This is not because Linda has a large head but rather that this was knitted while watching P at athletics club. I gaily cast on and knitted without a thought to gauge. Actually I did think oh, I should take some measurements but this thought was quickly forgotten as I realised that the tape measure was still at home. And so I continued to knit. The blues are more Rowan big wool from the basket, with Rico Creative Twist Super Chunky in light grey for the main part. Once complete and home I did remember the tape measure... and discovered how very much bigger than intended this hat was. I tried it on and Mr R said he liked it and thought that I had purposefully knitted Linda a rather on trend slouchy type hat. I was flattered by the notion that I had knitted something on trend, and so gifted it to Linda with the understanding that I would happily re-knit if she preferred a snugger fit. This offer has not been taken up, so obviously I have a trendy friend. With a warm head. Please do excuse the festive mug in February! 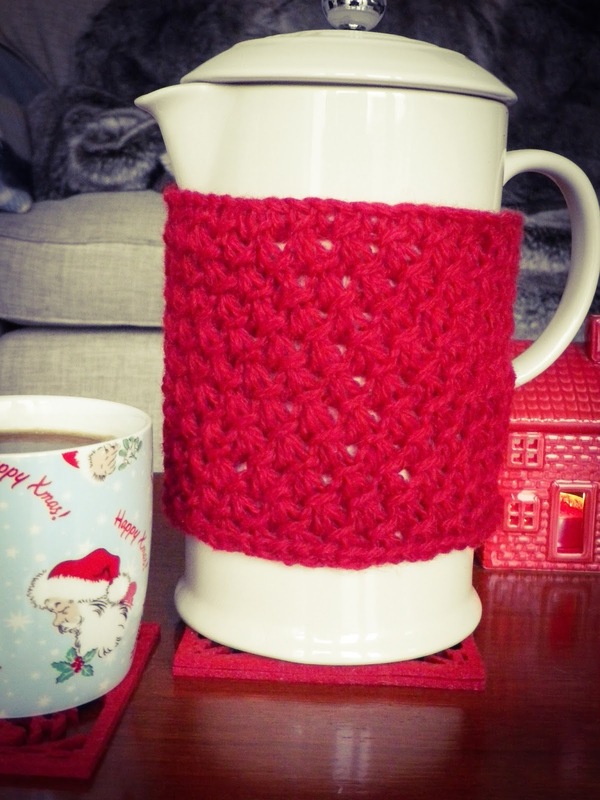 The pattern is Jenny Lord's cafetiere coffee cosy from Purls of Wisdom. This is the second time I've used this pattern, and the second time I thought ooo, must make one of those for me. The wool is Jamieson's Shetland Spindrift in crimson, which is just the perfect shade of Christmasy red, knitted double to get the required thickness. Hope you are enjoying lots of warm coffee Lou and Rachael. 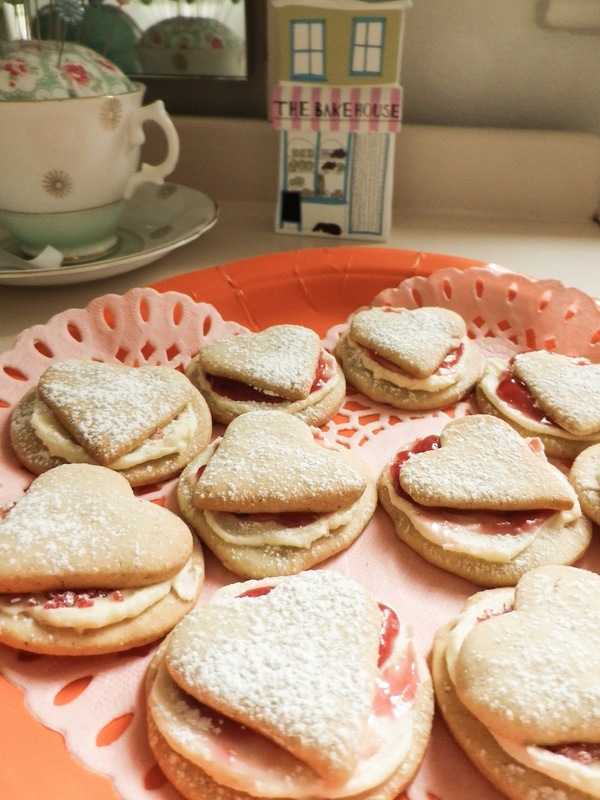 With cake, of course! Gosh, it does look big here. I had no head to measure it against as the head was residing in Holland with the rest of Frits, but it was true to the measurements given in the pattern. There is just the one size, which should fit most men it says. Actually I have seen a photograph of Frits wearing this, and it does appear to fit and actually looks rather nicer on than sitting here all wrinkly. That wavy edge on the ribbing! Smoothed out when worn I assure you. 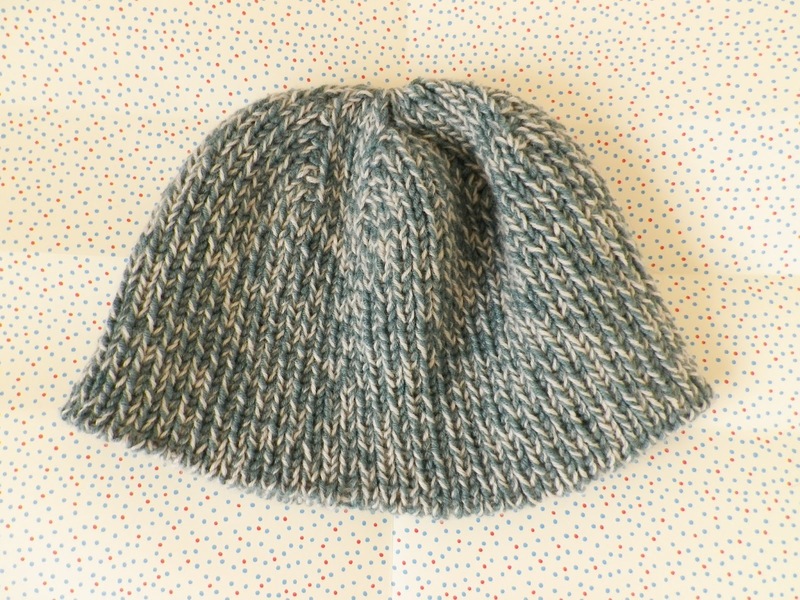 I used Cascade Yarns 220 superwash in the unimaginatively named grey. A nice squishy wool, so we shall forgive it its name. So, a nice hat -I really do like the look of the deep rib. More hats to follow! As I was looking through photographs of the many hats made so far this winter, I realised I had yet to show the costume Patch wore for the Christmas Play this year. Last year? Anyway, he was a rat. So festive! 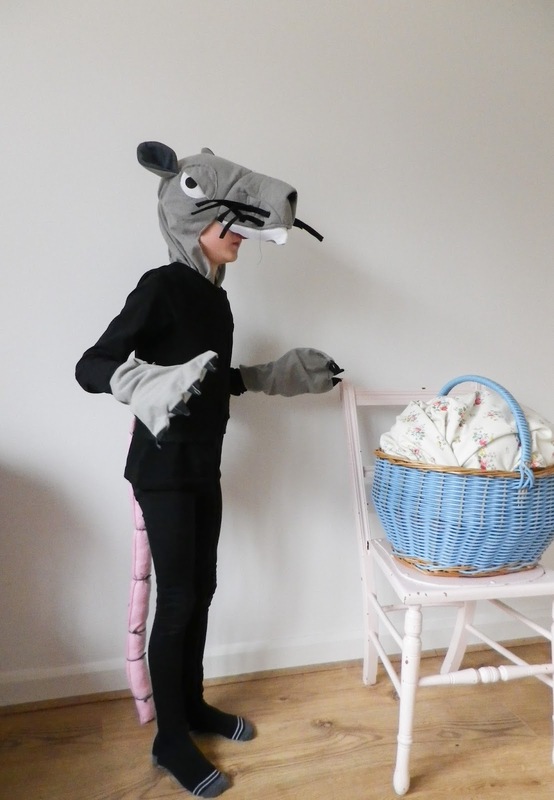 I had some thoughts as to how I may be making this rat costume when a Mum at school approached me in the playground and mentioned that she had a rat costume if we would like to borrow it. I had no idea you could actually buy a rat costume as it doesn't seem the most popular choice for dressing up. Mr R was with me and in the pause that followed her meaning-to-be-helpful offer he obviously sensed my thoughts and quickly jumped in with a yes please. Of course I was thinking very kind offer, but maybe you should ask if there are any other rats-to-be as I do like to make a costume. So we were presented with a head and paws, and together with a (shop bought) t and leggings I think Mr R assumed the costume was complete. 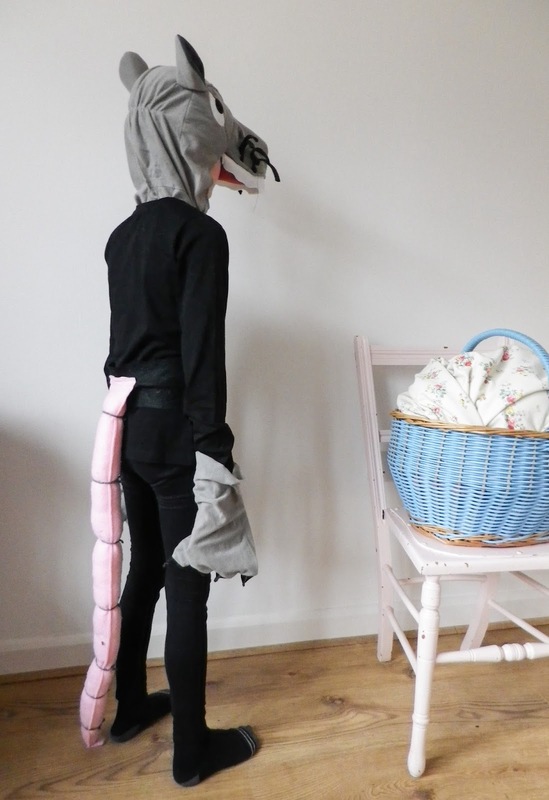 But I was certain that there was still the opportunity for a Mummy make because every rat needs a long tail. Two lengths of pink felt, tapered at one end, sewn along the long edges. I really did not want to struggle with turning this length of felt inside out, so the seams were just left on the outside. Stuffed and then sewn along the top edges to enclose the tail and attach it to a black belt, made from a wide strip of black felt with Velcro closure. And then maybe the bit that resembles a string of sausages, I wrapped bits of chunky grey wool along the length. Mr R refrained from too many I-told-you-so's when halfway through the play Patch appeared in another costume, this time as a cat. Turns out, the cat was poorly and Patch was asked to stand in. So yes, I am glad that I spent only a few minutes on this costume. Also glad that Patch forgot that he had the rat's tail attached and performed the rest of the play as a cat with a rat's tail. We actually shouldn't be surprised as the year before last the lovingly made angel costume was whipped off (it didn't even make it on to stage) and Patch was upgraded to one of the three kings. He said his one word beautifully but was overcome with emotion when at the end of the play the head asked everyone present to give him a round of applause. Thankfully, he coped much better this year! And as I have made so very many hats, I can't leave without mentioning one. Another Purl Bee classic cuffed hat, made just the same as the one shown last week here, but this time using Jarol heritage DK in teal. As soon as I saw the pattern for this hat I loved it. 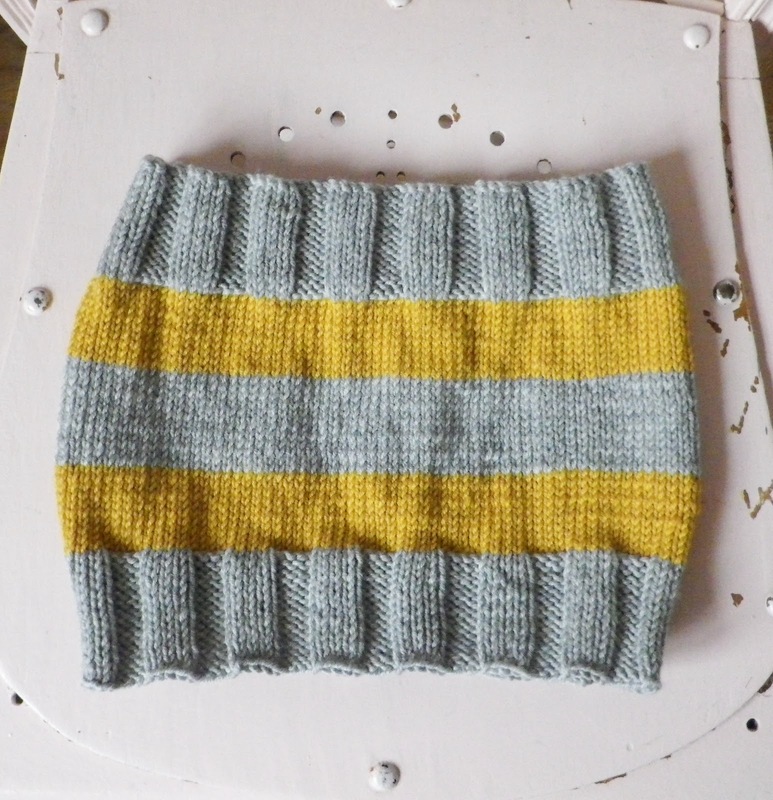 Perhaps not my most original knit, as I loved the picture I first saw and simply combined the colours used. 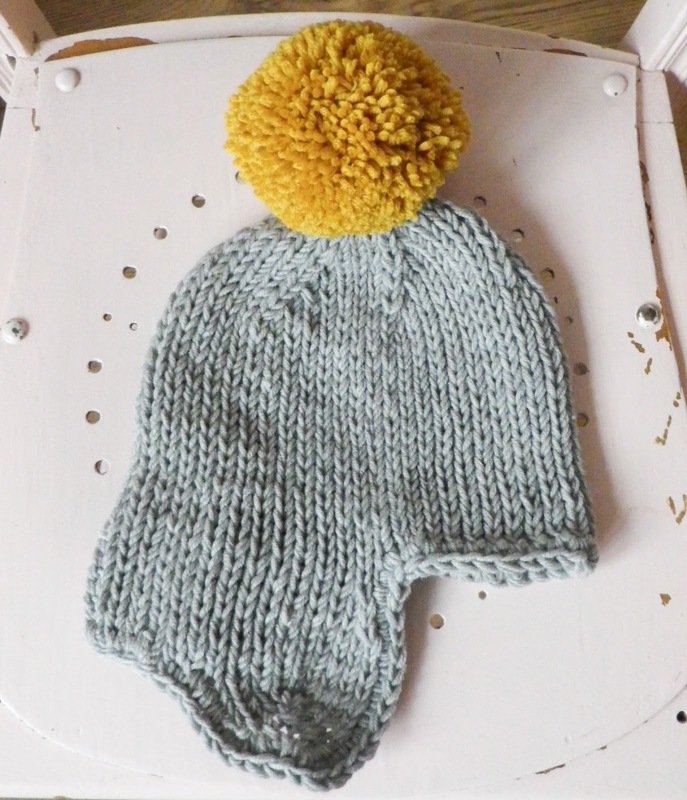 This is Purl Bee's cosy ear flap hat, knitted in Drops merino extra fine mix. I do like this wool so as it is soft, washable and a nice price! 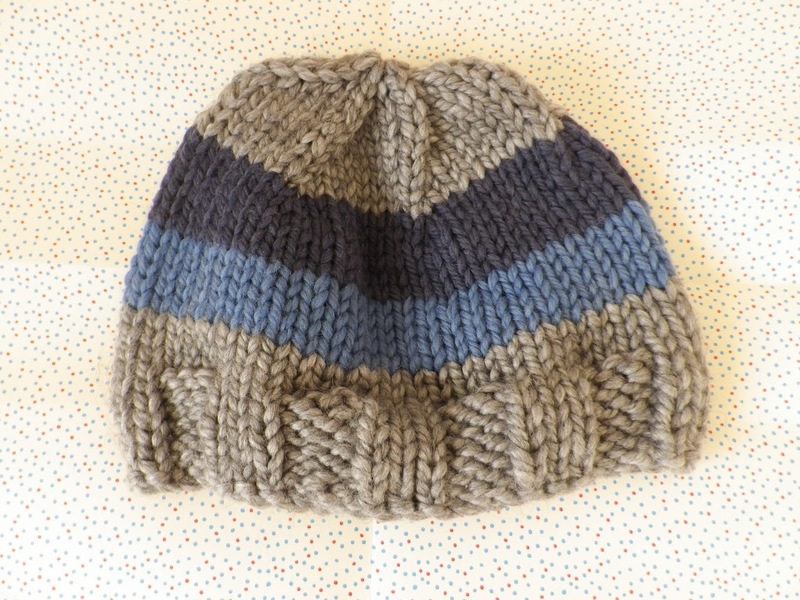 But not the best choice for this pattern - the pattern is for a chunky weight wool knitted on 8mm needles. As this Drops is knitted on 4mm I decided it would work if held double. 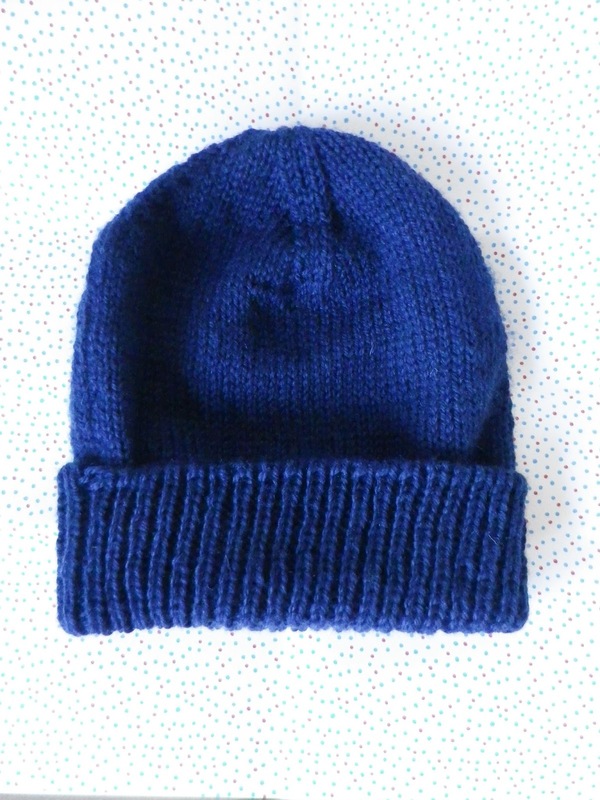 The final measurements were fine but the wool doesn't seem quite thick enough to me - the finished knit is fairly loose. Looks sweet though, and oh that pom-pom. Oh and colours used are light grey mix and mustard. This is a good yellow and must be used in many more knits. Oh so happy with these makes! Hopefully keeping a little two year old nice and snug... happy birthday, Jack!